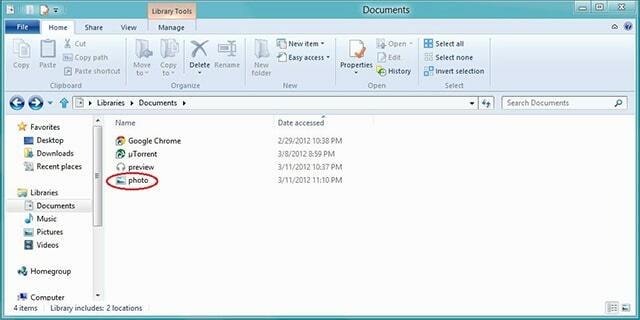 This post shows how to change the extension of a file in Windows 8. For example, if you have a file named photo.PNG and you may want to change it to photo.JPG, or audio.MP3 to audio.WAV. Changing the file extension on Windows 8 is completely different from changing it on Windows 7, Vista, or XP because Microsoft redesigned the file explorer toolbar. First to convert file in Windows 8, open Windows Explorer (or My Computer, My Document). Navigate to the file you want to change the file extension. Here, I used photo as an example. Like me, at first you will notice the name of the file doesn’t display its extension, it only shows the name of the file. Now we the name of the file to show the extension as well. 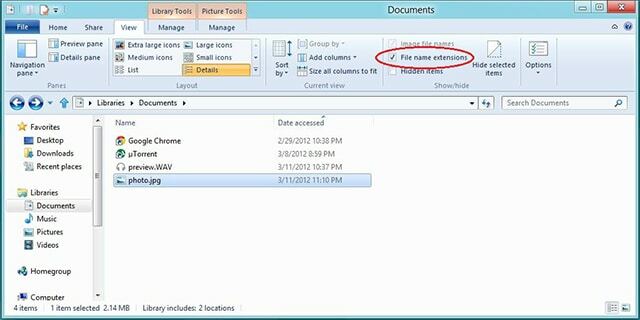 To do this, select the file you wish to convert its extension, or any file other file. After that, click the View in the toolbar. There at the left you will see an unchecked box that says File name extensions, check that box. Finally, after you do this, you’ll see the difference. The extension of the file will be at the end of the name. For example, my file named photo now appears to be photo.JPG. So to change the extension to another extension like PNG just rename the file and put the new extension after the period you want the file to be. Stay connected to your favorite Windows Applications on the go with a cloud based desktop by from CloudDesktopOnline and you can also add Office 365 from O365CloudExperts.